Nigerian teenagers, who flew the country’s flag at the 2018 First Global Robotic Olympiad (GRO) in Mexico, won two bronze medals at the competition involving 187 countries. The Nigerian team won the medals in the Outstanding Support and International Journey categories. There were 20 categories of awards at the event which ended on Sunday. The competition began on August 13. The challenge was on Energy Impact. Competitors were to solve problems related to energy with the use of robotics. Remi Willoughby, national coordinator of the GRO, told NAN on telephone from Mexico that there were 193 teams from 187 countries at the competition. Willoughby described Nigeria’s victory as an attestation that the Nigeria child was making progress in science technology engineering and mathematics. The five teenagers, aged from 15 years to 17 years, are from secondary schools in Lagos. They are four females and a male. They are Anjolaoluwa Olowokere from Lagoon School; Iroaganachi Udodirim, Queens College; Samuel Mbah, Osezele Comprehensive Senior Secondary School; Tochukwu Anyigbo, Lagoon School; and Daberechi Onyeacholem, Greensprings School Lekki. At a press conference in Lagos to announce the competition, Faisal Jarmakani, managing director, Aramex and Doculand Nigeria, sponsors of the team, had said that the teenagers were building the foundation blocks for a technology-advanced Nigeria. “Without any doubts, we will soon join other countries of the world where science and technology have become the backbone of economic development,” he said. In July, three Nigerian students won gold for proper documentation of processes on engineering note at the 2018 World Adolescent Robotic Competition in China. The students – Tawakalitu Giwa, Oluwaseun Omotayo and Ayomide Adetunji – also won the “Rajaa Cherkaoui El Moursli’ Award for Courageous Achievement at the event organised by the China Association of Science and Technology. The challenge was on Water Problem. An apocalyptic computer model developed by Massachusetts Institute of Technology researchers have predicted the end of the world as it is. The computer model processed by one of the world’s largest computers in 1973, predicted that the civilisation as it is will end by 2040, reports Express UK. This prediction showed that the world cannot sustain the current level of population and industrial growth for more than two decades. The model-based its predictions on trends such as pollution levels, population growth, availability of natural resources and quality of life on earth. Australian broadcaster ABC republished its original report from the 1970s, since there is just two years until a major change is expected according to the computer model. The eerie calculation has been remarkably accurate in certain predictions, such as a stagnated quality of life and diminishing pool of natural resources. Facebook Inc has so far suspended around 200 apps in the first stage of its review into apps that had access to large quantities of user data, in a response to a scandal around political consultancy Cambridge Analytica. Concerns have been raised about the new update of WhatsApp, which allows users to access videos and images they have deleted. It is believed the update clearly shows that the app stores users’ personal information for longer than it says it does. The update, which is now available to Android users worldwide, enables users to recover pictures, videos, GIFs, documents or voice notes that were sent and subsequently deleted. Tech website, WaBetaInfo said it was able to download images which had been deleted two or even three months ago. Normally Whatsapp stores images received for 30 days, so they can be downloaded. It then deletes the images after this time. WhatsApp’s parent company, Facebook has been under intense scrutiny in recent weeks as it was revealed 87 million of its users had their personal information harvested and used by the political consultancy firm Cambridge Analytica. Facebook has issued a series of apologies for the privacy breach and incorporated drastic changes to its privacy policies to stem the flow of thousands of users leaving the platform. Twitter said Thursday it has suspended over one million accounts for “promotion of terrorism” since 2015, claiming its efforts have begun to make the platform “an undesirable place” to call for violence. Considered by many to be the world’s greatest living scientist, Hawking was also a cosmologist, astronomer, mathematician and author of numerous books including the landmark “A Brief History of Time,” which has sold more than 10 million copies. With fellow physicist Roger Penrose, Hawking merged Einstein’s theory of relativity with quantum theory to suggest that space and time would begin with the Big Bang and end in black holes. Hawking also discovered that black holes were not completely black but emit radiation and would likely eventually evaporate and disappear. 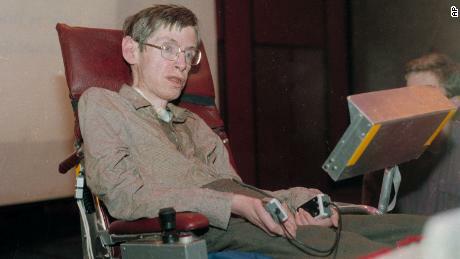 Hawking suffered from ALS (amyotrophic lateral sclerosis), a neurodegenerative disease also known as Lou Gehrig’s Disease, which is usually fatal within a few years. He was diagnosed in 1963, when he was 21, and doctors initially gave him only a few years to live. The disease left Hawking wheelchair-bound and paralyzed. He was able to move only a few fingers on one hand and was completely dependent on others or on technology for virtually everything — bathing, dressing, eating, even speech. “I try to lead as normal a life as possible, and not think about my condition, or regret the things it prevents me from doing, which are not that many,” he wrote on his website. Hawking was born in Oxford, England, on what an auspicious date: January 8, 1942 — the 300th anniversary of the death of astronomer and physicist Galileo Galilei. 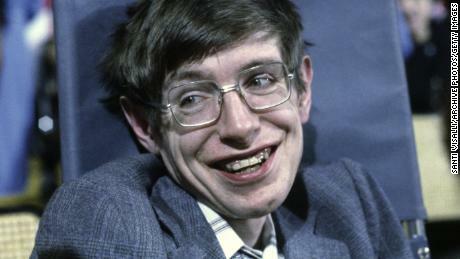 “I believe that the long-term future of the human race must be in space,” Hawking told CNN’s Becky Anderson. At Cambridge, he held the position of Lucasian Professor of Mathematics — the prestigious post previously held by Sir Isaac Newton, widely considered one of the greatest scientists in modern history — for 30 years until 2009. After stepping down, Hawking continued to work at the university as director of research at the Institute for Theoretical Cosmology. The following year, he co-authored “The Grand Design” with Leonard Mlodinow. “Science is increasingly answering questions that used to be the province of religion,” he added. Despite being a British citizen he was awarded the Presidential Medal of Freedom, the US’s highest civilian honor, in 2009 by President Barack Obama. In September 2016, Hawking joined 375 “concerned” scientists in penning an open letter criticizing then-presidential candidate Donald Trump, citing the threat of climate change and blasting his push for the US to leave the Paris accord. Hawking leaves behind three children and three grandchildren. “We are deeply saddened that our beloved father passed away today,” Hawking’s children, Lucy, Robert and Tim, said in a statement. “He was a great scientist and an extraordinary man whose work and legacy will live on for many years. His courage and persistence with his brilliance and humor inspired people across the world. Elon Musk, the chief executive officer (CEO), Tesla and SpaceX, has said the development of intelligent machines that far surpass human intelligence poses a greater threat to civilization than nuclear weapons. The business magnate, investor, and engineer told an audience at the South by South West festival in Austin, Texas, that efforts to advance artificial intelligence posed a “very serious danger” to the public, and called for Artificial Intelligence (AI) research to be properly regulated. Musk has been one of the most vocal critics of AI development, previously describing it as “our biggest existential threat”. The billionaire recently quit the board of OpenAI, a non-profit research group he co-founded to develop “safer” AI, to avoid any conflict of interest. He pointed to Google’s DeepMind AlphaGo AI, which defeated the world’s number one Go player Ke Jie in May last year. “Those experts who think AI is not progressing: look at things like Go,” Musk said. “Their batting average is quite weak. Musk questioned why no public body had been set up to oversee research into AI. “I’m not normally an advocate of regulation and oversight,” he stated. “This is a situation where you have a very serious danger to the public. There needs to be a public body that has insight and oversight so that everyone is delivering AI safely. This is extremely important. “Nobody would suggest that we allow anyone to just build nuclear warheads if they want, that would be insane. Musk is not alone in his dire warnings about a future world that is dominated by intelligent machines. Prof Stephen Hawking, one of the world’s foremost physicists, has warned that developing true AI “could spell the end of the human race”. “AI would take off on its own and re-design itself at an ever-increasing rate,” Hawking told the BBC in 2014. The end result, he said, will likely be good for the business in the long term. Security researchers have disclosed a set of security flaws that they said could let hackers steal sensitive information from nearly every modern computing device containing chips from Intel Corp, Advanced Micro Devices Inc and ARM Holdings. One of the bugs is specific to Intel but another affects laptops, desktop computers, smart phones, tablets and internet servers alike. Intel and ARM insisted that the issue was not a design flaw, but it will require users to download a patch and update their operating system to fix. Researchers with Alphabet Inc’s Google Project Zero, in conjunction with academic and industry researchers from several countries, discovered two flaws. The first, called Meltdown, affects Intel chips and lets hackers bypass the hardware barrier between applications run by users and the computer’s memory, potentially letting hackers read a computer’s memory and steal passwords. The researchers said Apple Inc and Microsoft Corp had patches ready for users for desktop computers affected by Meltdown. Daniel Gruss, one of the researchers at Graz University of Technology who discovered Meltdown, called it “probably one of the worst CPU bugs ever found” in an interview with Reuters. Speaking on CNBC, Intel’s Krzanich said Google researchers told Intel of the flaws “a while ago” and that Intel had been testing fixes that device makers who use its chips will push out next week. Google said it informed the affected companies about the “Spectre” flaw on June 1, 2017 and reported the “Meltdown” flaw after the first flaw but before July 28, 2017. It also reported that the updates to fix the problems could cause Intel chips to operate 5 per cent to 30 per cent more slowly. A statement by Intel indicated that it has begun providing software and firmware updates to mitigate these exploits. ARM spokesman Phil Hughes said that patches had already been shared with the companies’ partners, which include many smartphone manufacturers. “This method only works if a certain type of malicious code is already running on a device and could at worst result in small pieces of data being accessed from privileged memory,” Hughes said in an email. A rare public spat in the technology industry escalated when Google said it would block its video streaming application YouTube from two Amazon.com Inc devices. Google also criticized the online retailer for not selling Google hardware, Media reports on Wednesday. The feud is the latest in Silicon Valley to put customers in the crossfire of major competitors. Amazon and Google, which is owned by Alphabet Inc, square off in many areas, from cloud computing and online search, to selling voice-controlled gadgets like the Google Home and Amazon Echo Show. The stakes are high: many in the technology industry expect that interacting with computers by voice will become widespread, and it is unclear if Amazon, Google or another company will dominate the space. Amazon’s suite of voice-controlled devices has outsold Google’s so far, according to a study by research firm eMarketer from earlier this year. “Given this lack of reciprocity, we are no longer supporting YouTube on Echo Show and Fire TV. We hope we can reach an agreement to resolve these issues soon,” Google said. The break has been a long time coming. Amazon kicked the Chromecast, Google’s television player, off its retail website in 2015, along with Apple Inc’s TV player. Amazon had explained the move by saying it wanted to avoid confusing customers who might expect its Prime Video service to be available on devices sold by Amazon. Amazon and Apple mended ties earlier this year when it was announced Prime Video would come to Apple TV; not so with Google. In September, Google cut off YouTube from the Amazon Echo Show, which had displayed videos on its touchscreen without video recommendations, channel subscriptions and other features. Amazon later reintroduced YouTube to the device. However, the voice commands it added violated the use terms and on Tuesday Google again removed the service. The Fire TV loses access to its YouTube app on Jan. 1, Google said. Apple stores in the US and UK have begun the sale of MekaMons, a gaming robot built by Silas Adekunle, a Nigerian-Briton. Adekunle, an engineer, graduated with first class honours from the University of the West of England in Bristol, with a bachelor of science in robotics technology. He was born in Nigeria but moved to the UK when he was 11 years old. His company, Reach Robotics, an augmented reality gaming company which creates robots for both fun and STEM education, struck the deal with Apple recently. MekaMons has been on sale since November 16 for $299.95. The four-legged robots can be controlled via an iPhone and other smartphone using a companion app for augmented reality gameplay. “We’ve created an entirely new video gaming platform,” Adekunle said in a statement by Black Enterprise. “MekaMon straddles both the real and virtual worlds while taking the gaming experience beyond a player’s screen and turning their sitting room into a limitless robotic battle zone. “MekaMon represents a quantum leap forward in the leveraging of augmented reality. Players can whip out their iPhone to battle their multi-functional, connected battlebots in the physical and virtual worlds at the same time. “When I was a student at UWE Bristol I spent some time going into schools to help inspire young people and it struck me that there was a huge untapped market for a consumer robot with a difference. “We used to go in and explain simple robotics to try to inspire the young roboticists and engineers of the future and this experience set me off thinking about designing gaming robots. “This is an exciting time for our company as now after years of development work we are finally able to bring Mekamon to customers across the UK and US and with plans to go global. Maps and Street View from Google, American multinational technology company, is positively impacting geospatial services in Nigeria, a report has revealed. Launching the report conducted by a research group, Alpha Beta, on the economic impact of geospatial services in Nigeria, Google noted that its tools like Maps and Street view are making positive economic contributions around the globe to employment, emergency responses and time management. The report reveals that digital maps reduce travel time in Nigeria by an average of 8%, saving some ₦190 billion (US $748 million) based on local wages. Similarly, among Nigerians, digital maps are valued at ₦22,131.00 annually – translating into ₦1781 billion per year for all users. At the launch in Abuja, Titi Akinsanmi, Google Policy and Government Relations Manager said: “We worked with Alpha Beta to support a study that quantifies the economic impact of the geospatial technology, looking at the benefits and value geospatial technology brings to consumers, businesses and society. According to the report, about 86% of the online population in Nigeria use digital maps and geo-enabled apps for various reasons but, most especially for education and social networking. The report also shows that geospatial services could have a significant productivity impact in sectors that can grow the Gross Domestic Product in the country. At the launch of the report in Abuja, Google also shared its journey of Maps in Nigeria. The company has worked with Nigerians since 2012 to add thousands of roads, landmarks, and businesses throughout the country to Maps. In 2013, Google introduced Turn-by-Turn navigation in Nigeria for users using Google Maps for Mobile. In 2014 Real-Time Transit information on the LAGBUS was launched to help people in Lagos access bus times on BRT routes. In 2015 real-time traffic updates was introduced, as a way to help people better navigate busy traffic conditions. In July 2017 Google announced the launch of Street View in Nigeria making imagery of about 10,000 kilometers of roads in Lagos available to people in Nigeria and around the world. Speaking at the launch, Titi Akinsanmi, Google Policy and Government Relations Manager said, “We worked with AlphaBeta to support a study that quantifies the economic impact of the geospatial technology, looking at the benefits and value geospatial technology brings to consumers, businesses, and society. “Digital Maps have become powerful tools for policymakers to ensure the safety of their citizens, and for companies and consumers to save time and money when managing their daily affairs. And their benefits are far bigger than people may think. We discovered that geospatial services not only make life easier — by helping people turn their intentions of finding a place into actions of getting there – but also support the global economy by creating tangible benefits for businesses and consumers,” she says. Each month, more than one billion people use Google Maps to find, discover and explore their world. Nearly one-third of all mobile searches are related to location, and location-related mobile searches are growing by 50% faster than all mobile searches. Facebook CEO Mark Zuckerberg has issued a public response to a tweet earlier Wednesday from President Trump, who claimed that the social network “was always anti-Trump” during the 2016 presidential campaign. Zuckerberg’s statement comes on the same day that Facebook, Google, and Twitter have been asked to testify before Congress on November 1st, where they’ll face questions about Russia’s meddling in the 2016 election and how it might have used their platforms to spread misinformation in an attempt to influence the outcome. Facebook groups associated with Vladimir Putin may also have organized pro-Trump rallies on US soil. “After the election, I made a comment that I thought the idea misinformation on Facebook changed the outcome of the election was a crazy idea,” Zuckerberg said yesterday. “Calling that crazy was dismissive and I regret it. This is too important an issue to be dismissive.” That’s the most direct about-face that Zuckerberg has made on his controversial November remarks. The company has also agreed to provide Congress with Russia-linked ads that moderators told The Verge they were left unprepared to catch, and Zuckerberg on Wednesday delivered a statement to viewers on Facebook Live announcing that the social network will no longer accept untraceable ads. “We’re going to bring Facebook to an even higher standard of transparency,” he said. But Zuckerberg is still very, very insistent that Facebook is doing far more to help the democratic process than to harm it. Dubai has test-flown a crewless two-seater drone designed to transport people autonomously. The AAT is environmentally friendly, powered by electricity, and the prototype version has a maximum flight time of 30 minutes, at a cruising speed of 50 km/h (31 mph), and a maximum airspeed of 100 km/h (62 mph). The drone was uncrewed and hovered 200 meters high during the test flight, according to Reuters. The AAT, which is about two meters high, was supplied by specialist German manufacturer Volocopter, known for its eponymous helicopter drone hybrid with 18 rotors. The AAT is fitted with optional emergency parachutes and nine independent battery systems. Each battery takes two hours to fully charge, but that charging time will be “significantly reduced” in the final production version of the taxi, the Government of Dubai claims. There are also plans to make AAT available to the public via a smartphone app that would allow users to book flights and track routes. The Government of Dubai says over the next five years, Dubai’s Road and Transport Authority (RTA) will work with the country and city’s aviation authorities to develop policy and laws for the AAT and its services. Trial operations will take place during this time, and US company JDA Aviation will oversee preparations for the AAT flights and manage safety. Dubai has a target for autonomous transport to account for a quarter of total trips by 2030. “Encouraging innovation and adopting the latest technologies contribute not only to the country’s development but also build bridges into the future,” Dubai Crown Prince Sheikh Hamdan bin Mohammed said in a statement. Facebook says it has discovered a Russian-funded campaign to promote divisive social and political messages on its network. The company said $100,000 (£77,000) was spent on about 3,000 ads over a two-year period, ending in May 2017. The ads did not back any political figures specifically, but instead posted on topics including immigration, race and equal rights. Facebook said it was co-operating with a US investigation into the matter. The advertisements directed users towards around 470 accounts that spread false information or were otherwise in breach of Facebook’s terms and conditions, the site said. “The ads and accounts appeared to focus on amplifying divisive social and political messages across the ideological spectrum,” the company said in a blog post published on Wednesday. The company said it believed, but could not independently confirm, that the accounts were created by the so-called Internet Research Agency, a St Petersburg-based group known for posting pro-Kremlin messages on social media. The accounts in question have now been shut down, Facebook’s chief security officer Alex Stamos added. The campaign was uncovered as part of Facebook’s internal investigation into ways in which the network may have been abused during the last US presidential election campaign. The site, and its founder Mark Zuckerberg, came under extremely heavy criticism for not taking the issue seriously in the days following President Donald Trump’s election win. Mr Zuckerberg dismissed the notion that “fake news” on Facebook swayed the election as “crazy”. In Wednesday’s post, Mr Stamos went into detail about how the campaign was uncovered. “[We] looked for ads that might have originated in Russia, even those with very weak signals of a connection and not associated with any known organized effort. “This was a broad search, including, for instance, ads bought from accounts with US IP addresses but with the language set to Russian – even though they didn’t necessarily violate any policy or law. News of Facebook’s discovery came on the same day Facebook was accused of inflating its advertising reach. According to a report in the Wall Street Journal, Facebook told potential advertising partners that it could reach 41m 18-24 year olds in the US. However, according to official US census data, there should only be 31m people of that age in the country. Richard Newman, a lawyer specialising in online marketing, said the scale of the issue was too small to cause Facebook any significant headache – but the company did need to get on top of the issue. “Facebook clearly has a dominant position in social media space and internet advertising,” he told the BBC.